Craig Mumm leads a sectional of violas. Photo by Junyi Chow. When the power of live music is combined with the power of education, not just change, but actual transformation ensues. Eliciting and encouraging this transformation is the mission of the New York Youth Symphony: to educate and inspire young musicians through exceptional ensemble training and performance opportunities. 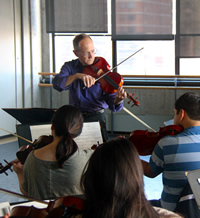 For over 50 years, the orchestra has provided local students, ages 12 to 22, with tuition-free musical programs, performing a wide range of orchestral, jazz and chamber music works under the direction of gifted young conductors. Additionally, students can enroll in vital workshops on auditioning and careers in music, a component that other organizations often ignore. Executive Director Shauna Quill recently spoke about the other mission of the orchestra: to engender in each student a deeper understanding of the power of music. Quill referred to the students as “musical citizens” who will, hopefully, carry their youth orchestra experience into adulthood, regardless of whether or not they become music professionals. The current music director, 28-year-old Joshua Gersen, joined the organization in 2012. He will have the prime opportunity to design programs that not only challenge the orchestra, but also expand his personal orchestral repertoire. Gersen invited Local 802 member Harrison Hollingsworth to serve as assistant conductor. Hollingsworth plays principal bassoon with the New York City Ballet and has enjoyed working with young musicians in various capacities all his life. The New York Youth Symphony continues to nurture superlative professional musicians. But more than that, it engenders a new group of “musical citizens” each year who will carry the meaning and power of live music with them throughout their lives, passing the joy on to future generations. Transformation ensues.